This is Amin, one of the baristas at ‘Tween’s Beans Coffee Shop. Last weekend, I met my brother Jeff and his family at ‘Tween Waters Inn for a little rest and relaxation. We were catching up over cheeseburgers at the Oasis Pool Bar (sitting at that hidden high top table mentioned in Michele Anderson’s blog), enjoying the warm, March weather when the afternoon sleepies started to set in. The cure? A walk across the pool deck to ‘Tween’s Beans Coffee Shop. 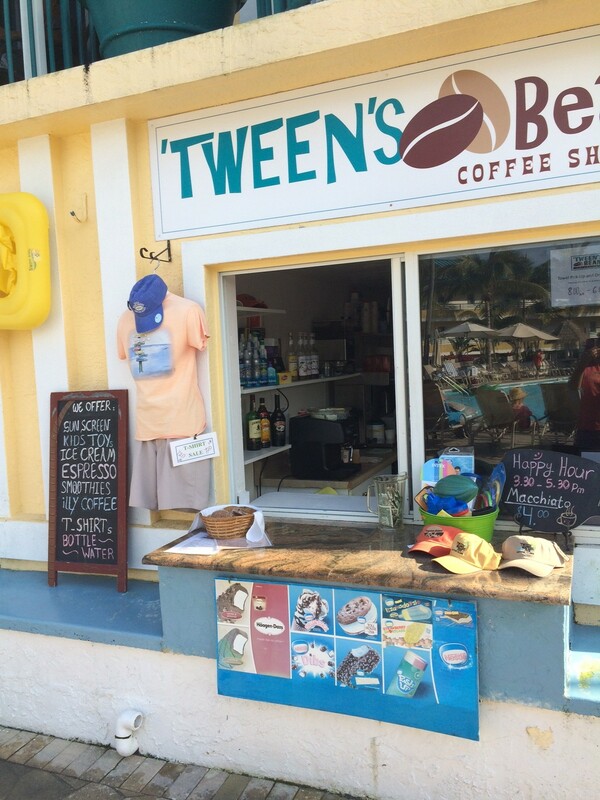 Walk on over for daily happy hour and more at ‘Tween’s Beans Coffee Shop. The cousins get an afternoon pick-me-up at ‘Tween’s Beans. For the kids or kids at heart, sip a frozen Banana Split, a Burst O’Berry or a Cookie Monster (made with ice cream, Oreos, and chocolate syrup). Baristas Chelsey and Amin will take great care of you and are more than happy to make you a custom creation – just ask. Did someone say Happy Hour? You bet. Every day from 3:30-5:30, you’ll find ‘Tween’s Beans drink specials. You’ll also find an assortment of ice cream treats, along with shirts, hats, beach toys, and those Tervis tumblers that I love so much. (Seriously, they are the ideal souvenir – they’re indestructible and they’re guaranteed for life!) So, stop by ‘Tween’s Beans Coffee Shop, and see what fun you can stir up. My brother Jeff snagged the corner table at Oasis Pool Bar.